In this MN Original segment, Rathman prepares for shows in Los Angeles Mark Moore Gallery and in Minneapolis Weinstein Gallery. His watercolor paintings of stereotypically masculine subjects like cowboys, race cars, sports insignias and rock and roll album covers evoke a playful dialogue on subjects drawn from the American psyche. David Rathman's watercolor paintings of stereotypically masculine subjects like cowboys, race cars, sports insignias and rock and roll album covers evoke a playful dialogue on subjects drawn from the American psyche. 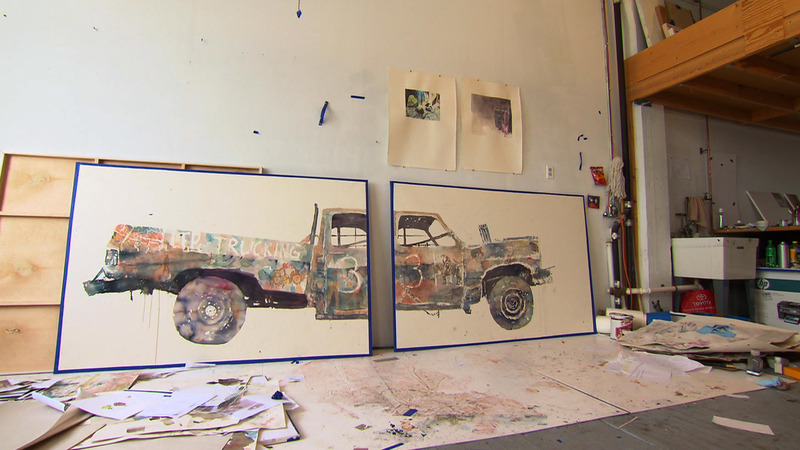 In this segment, Rathman, an MCAD alumnus and recipient of awards from the Jerome, Bush, and McKnight Foundations, prepares for shows in Lost Angeles' Mark Moore Gallery and Minneapolis' Weinstein Gallery. David Rathman depicts stereotypically masculine subjects in his watercolor paintings.